St. Andrew's-Sewanee School history teacher Geoffrey Smith has received one of six 2016 Outstanding Educators Awards from Humanities Tennessee. The awards recognize teachers who have demonstrated excellence in teaching the humanities and who encourage the humanities to be an important part of their students' lives. Smith was nominated for the award by SAS parents Eric and Lisa Hartman. In their nomination, the Hartmans wrote, "Mr. Smith is a walking, breathing, teaching historian. It is impossible to encounter him and not learn. Every school should be fortunate to have educators like Mr. Smith, but in the absence of ethical cloning strategy, we are nominating his for this distinction, such that other teachers might come to know him and be inspired by his work." Each of the 2016 recipients, selected from a pool of nominees from across the state, receive a $2,000 fellowship to further their professional development in the humanities, and their schools receive $1,500 for humanities programs and materials. Smith will use his portion of the award to conduct place-based research on the life and work of Pulitzer Prize winner James Agee, a distinguished alumnus of St. Andrew's-Sewanee School, examining themes of religion, education, childhood, labor, and the transition to adulthood. The research will include travel to Knoxville, Tenn.; Exeter, N.H.; Cambridge, Mass. ; New York City; Nashville; and various locations in Alabama, all touchstones in Agee's life. The school's portion of the award will be used to expand programming for SAS's annual Day of the Book Celebration, which, in fall of 2016, will be a celebration of the centennial of the Pulitzer Prize. The day will include workshops on the life and work of James Agee and other Pulitzer Prize-winning authors. SAS will also collaborate with local public elementary schools to promote literacy and celebrate freedom of expression. In March, Smith received the 2016 Belz-Lipman Holocaust Educator Award sponsored by the Tennessee Holocaust Commission. The award, established by Memphis entrepreneurs and philanthropists Jack A. Belz and Ira Lipman, recognizes outstanding educators who excel in the teaching of the Holocaust. Smith is a graduate of the University of the South with a B.A. in history. 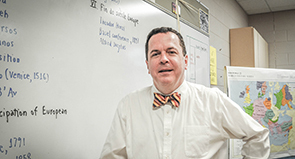 He joined the SAS faculty as history teacher in 2014. He formerly taught at the All Saints' Academy in Winter Haven, Florida where he was chair of the History Department. Since the Humanities Tennessee Outstanding Educators Award program began in 1985 almost $500,000 has been presented to educators and schools in Tennessee. Educators across the state have been able to advance their knowledge of the humanities through traveling, attending seminars and workshops, and participating in research in order to better educate their students on the subjects of language, literature, history, philosophy, archeology, ethics and the history and criticism of the arts. Humanities Tennessee, an independent affiliate of the National Endowment for the Humanities, is a statewide nonprofit organization headquartered in Nashville.